While most pet owners understand the importance of keeping their dogs away from pest spray, cleaning products and fertilizers, they don’t realize the risks posed by many of the plants in their own backyard. Purple fountain grass is a popular plant that can negatively affect your dog. It is essential that you research each plant that you place in your backyard in order to ensure the life and health of your pets. Purple fountain grass is an ornamental grass also known as Pennisetum setaceum “Rubrum.” With its striking color and long flowers, purple fountain grass is a very popular planting. This grass is relatively sturdy, does well in various types of soils and climates and is a generally sturdy plant. Purple fountain grass has been listed as a non-toxic plant by Pawprints and Purrs Inc. This means eating purple fountain grass most likely won’t result in death, but it still can cause symptoms such as vomiting, diarrhea, depression or a combination of these symptoms. In addition, the blades of purple fountain grass are relatively sharp, and consumption of them may cause pain or dysfunction to your dog’s digestive system. If you dog eats purple fountain grass, the symptoms most likely will resolve on their own. However, if your dog displays symptoms such as decreased appetite, or if its stomach appears to be tender to the touch, consult your veterinarian. Why Do Dogs Eat Purple Fountain Grass? Dogs are by nature scavenging omnivores, which means they will eat both meat and fruits and vegetables, depending on what is available to them. 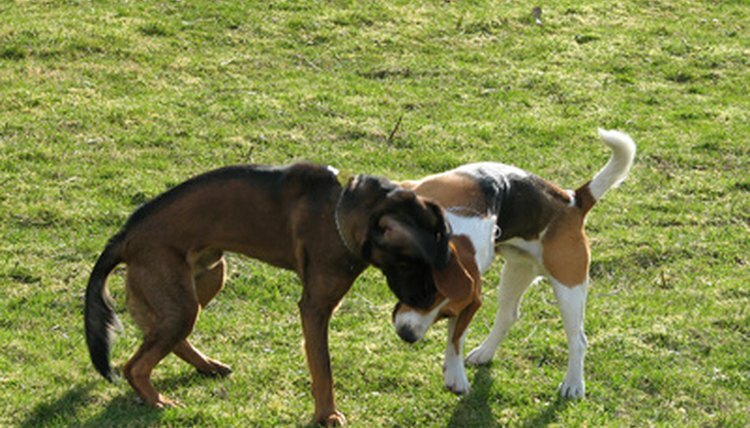 Dogs occasionally will eat grass if they have an upset stomach. While Purple Fountain Grass isn't toxic to dogs, it also isn't necessarily good for them to eat. If your yard or garden contains this plant, consider building a small fence around it to keep your pet safe. If this is not an option, keep a close eye on your dog while it is outside. Is Jasmine Poisonous to Chickens? Are Peonies Poisonous to Cows? Does Wheatgrass Have Benefits for Dog Digestion?